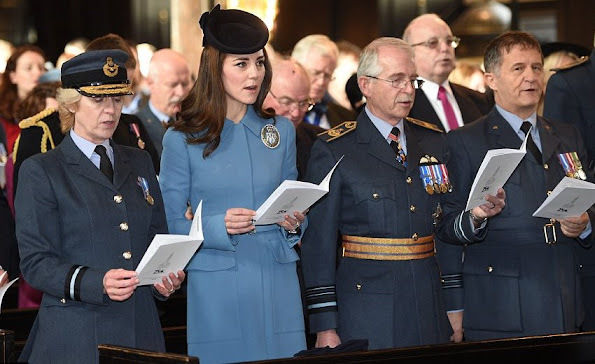 Catherine, Duchess of Cambridge, Honorary Air Commandant attended a church service to celebrate 75th anniversary of the RAF Air Cadets at St Clement Danes Church on February 7, 2016 in London, England. 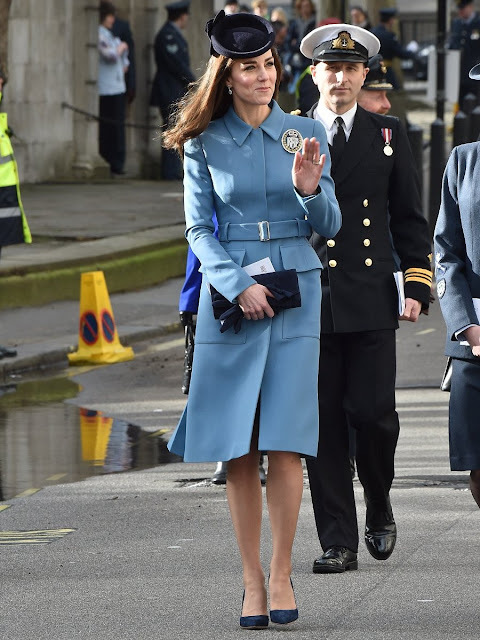 (The Duchess brought back her popular light blue Alexander McQueen coat for the ceremony. Duchess wore a new pair of Rupert Sanderson Malory shoe. The Duchess carried her navy suede Russell & Bromley handbag. The Duchess completed her outfit with diamond earrings). My first thought too...trouble in paradise. Sorry to say this, but compared to pictures from 2011, she def. lost her spark. Question: Comes that with motherhood??? As for my concern she looks horrible, very old and i especially do not like the hat. The same here. I don't understand this outward transformation. Ok, I dislike Sofia Hellqvist, but one good thing she has is a nice make-up. She looks fresh (when mouth shut!) and her eyes as her best asset are pointed without being caked-on. Kate somehow is not able to carry it off. Coat. Ill fitting fascinator. Belly hiding with a clutch. Poor posture. Alternating big grin with hair playing. Well. Kate being her boring self. Elegant von Kopf bis Fuß! Endlich hat sie auch mal den dicken Kajalstrich unter ihren Augen reduziert (im Gegenzug aber leider bei den Augenbrauen wieder übertrieben)!! My my my.....this site must be for Kate bashers....nothing good to say...whata shame!!! You can follow a Katefan blog! 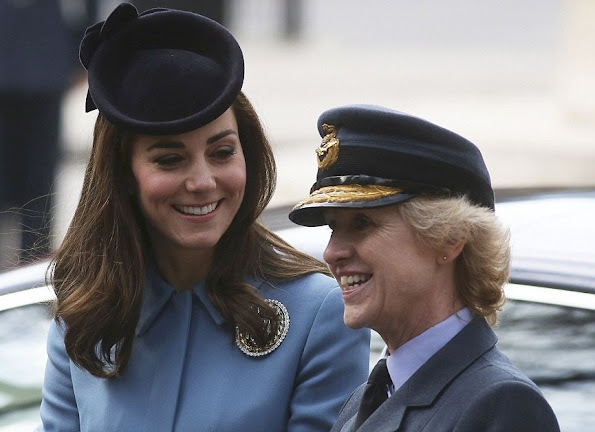 I'm not a Kate basher, but I'm not fascinated by her fascinator, nor her hairdo, nor her make-up. As for looking tired because she has two young kids, she has nannies, maids, housekeeper to help her. She looks lovely -- beautifully and classically dressed and regal and warm in manner. I like her well fitting coat very much. Black hat suits well to coat but is a bit harsh to her complex. But the model of hat is nice. In other site I saw some pics where she is smiling broadly, she looked there stunning. No, she cannot, because she can not. She wears her Australia-coat, one of the 100000 light blue coats she owns. Not to jump on the 'have a go at Kate' bandwagon, but I think it's time she started wearing her hair up, when's on royal duty. In most images of her on duty she's figeting with her hair ! She looks like, she's just realised she needs to be somewhere, thrown on her 'Sunday best' coat and hat, and dashed out ! Come on Kate, take a leaf out of HM 'how to dress' book, and make a little more effort. It was a smart move to cut her hair to this length, she can style it herself. If she's not I'm shocked because it doesn't look it's professionally done here. She should probably ditch the red tones in her hair by the way, they do nothing for her. Son MU est beaucoup trop foncé dur les yeux et les sourcils et le visage trop pâle. Cela lui donne l'air malade !!!! It is said, that she does her make-up on her own. Her wedding cake-on-make-up was made by her as well. I think that the biggest problem with Kate is the eye makeup. Thick black lines make her eyes look tinier and its too harsh for her paler skin tone (besides she's no rock chick!!). Oh, yes, Kate's eye makeup look too harsh and therefore she appear much older. Its sad but nothing that can't be corrected! Unfortunatelly very true and totally poor. C'mon, Duchess, work on your posture befitting a future Queen Consort. Hold your head up (your mother-in-law was even worse in that regard, trying to be so coy). The duchess looks so much better with her hair in a nice up-do. And why wear earrings that can been seen only when the wind blows or she fiddles with her hair. Sorry, but not everyone is a huge fan of this woman; some of us do tend to criticize her and like other royal women over her. We're not cruel, we just have different opinions, likes, dislikes - just as do the ones who criticize us. The hat and her hair, very strange! You can not compare sparkling princess Sofia with dutchess Kate, a whole lot of differences!!!! Then I prefer boring Kate! Grotesque headpiece, hat or whatever that eyesore is named, clutch in her signature fig leaf position and expensive but not too well fitted coat. She could wear all those pieces ten years from now and even then they will be too old lady for her. Very lovely. Glad she was there to commemorate their 75th anniversary. That is the third time she has work this Alexander McQueen coat to a military-related event. I don't think Kate looks bad, but she certainly doesn't look her best. Her makeup has improved every so slightly, in that she has lightened the heavily drawn under eye eyeliner, however she needs to lighten her eye makeup and brighten her eyes and the rest of her face. Nothing extreme just a light hand and a little bit of colour. Kate has beautiful hair, but she does nothing with it. 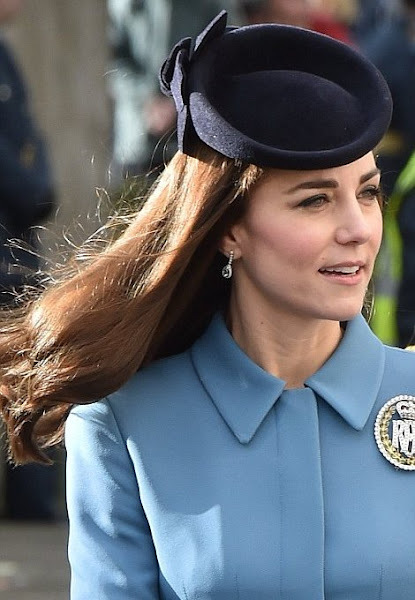 I know CP Victoria get bagged or wearing her hair in a ponytail or a bun, but Kate would look so much better if she did the same as it would lighten and lift her face (as well as suit her choice of head wear). Putting her hair up would also help show of her features, she is an attractive woman. Add lighter eye makeup, a little blush and perhaps even a little lipstick or if she can't be that daring a lip gloss or or tinted lip balm and she would look lovely. Kate had colour on her face on her wedding day, and it suited her. It isn't as though his family or hers are hard up for cash and can't afford to call in a stylist, they could and they should. Kate is a young woman making herself look older than her years and that is a shame. No one wants or expects her to be another Diana and I hope Kate feels that she isn't walking in Diana's shadow. I hope this young woman doesn't feel that seeking style advice would seem as though she is trying to draw attention to herself. 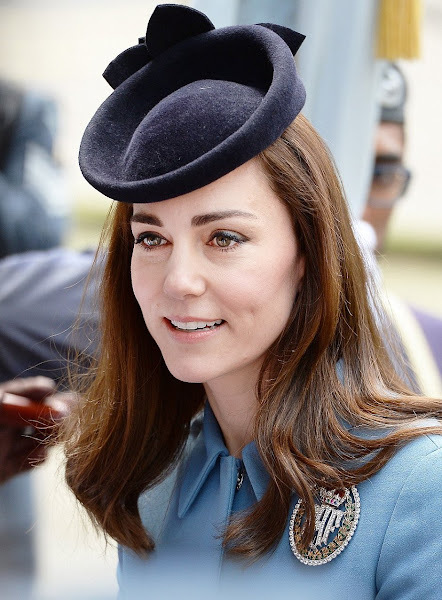 I think most young woman in her role, who aren't born into the position have sought the help of stylist (to their benefit) and I hope Kate does to, as she is looking increasingly uncomfortable. I do not agree in all terms, especially not in the last. I think she is doing much better than a few monthes ago. Actually she looks really natural now and you can see, that Prince George looks after her. I think her make-up not so bad. If her face becomes a bit fuller, then she will look gorgeous. I find tireness in her eyes, but it's not a shame. We can't blame her on that. Some of the people here are waiting to criticize everything about Kate. She never stated that she is the most beautiful girl in the world or the best dressed. I cannot understand at all those nasty comments here in this thread. I think Catherine looks just fine and classic and fine. Well done, Duchess of Cambridge. Once again suitable dress to fit the occasion. Don't want to draw attention with her clothes but attention to the event. The Duchess is beautiful and nothing is wrong with her. She always dressed to the occasion. Sorry can't say the same of all the other darlings in Royal Houses, Maxima, Mary, Victoria and the rest.